"Smart-living, Micro-farm" - A model home built with locally harvested bamboo, locally mined earthen floors (clay and stone), recycled P.E.T. joints and a salvaged-billboard roof. "Chill Spot Roof" - an outlying structure for various uses, in this case for a relaxation/communal area. After the first season of alternative farming our neighbors were already impressed; the Pig Gardens produces the largest cassava tubers the village has ever seen. 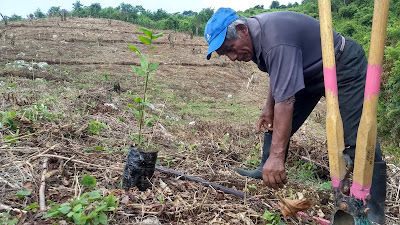 Here at Wübu, a farm near Livingston, Guatemala, we're demonstrating sustainable strategies—regenerating soil, planting for biodiversity, using organic pesticides. With 100 acres to convert from chemical cornfields to organic polycultures, designing new cultivation areas has been a reoccurring job. 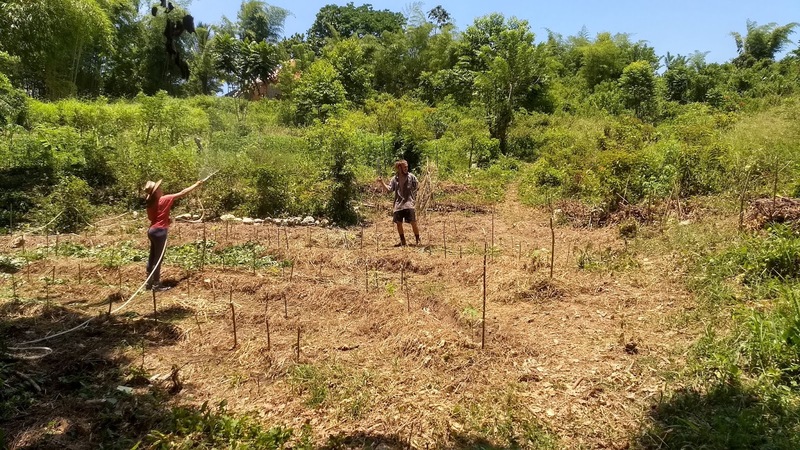 The Goat Gardens (named for the livestock who initially cleared the area) are one of many such jobs, from which our methods are constantly being improved and adapted. It's also the example here for sharing Four Tips for Sustainable Farm Design. Here's a quick video I made about stopping soil erosion. 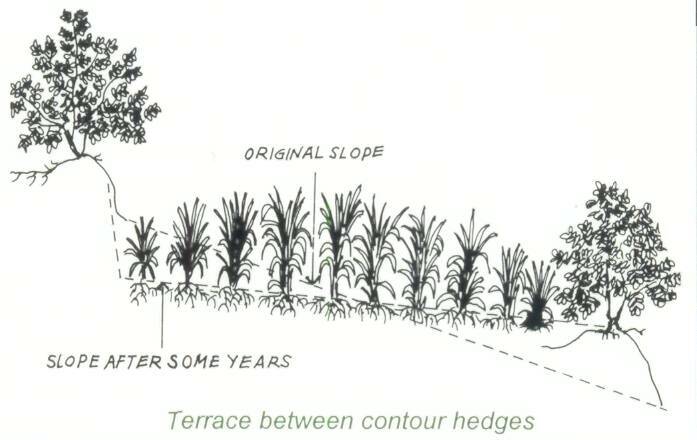 It includes two simple methods and the three key concepts preventing erosion. Filmed at Wubu, Model for Rural Development near Livingston, Guatemala. Starring Pablito, a local worker here. 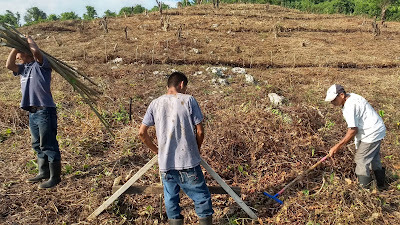 See a more recent and much larger project at the same site: Wübu Agroforestry - Corn and Contour lines in Tropical Guatemala. Rent is free this year for local tenant farmers. 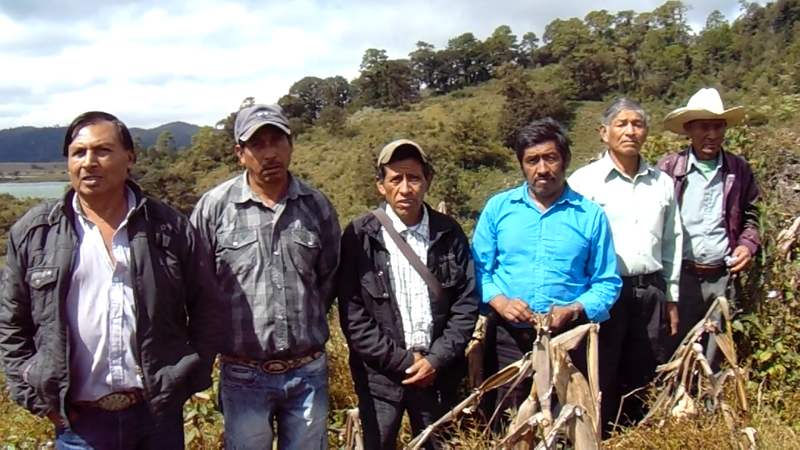 The milperos (those who plant milpa, or corn) can continue sustaining their communities, Miramar and San Marcos. In exchange for the land, certain terms apply. For example, no more herbicide; weeds must be chopped and dropped by hand. 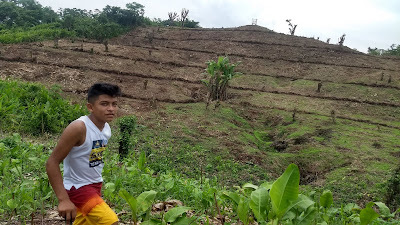 Another example, no more monocultures; all land planted with milpa must also be inter-planted with bamboo, fruit trees and other perennial crops. Such terms help implement a new agroforestry system here at the 100-acre Wübu, a Model for Rural Development near Livingston, Guatemala. El alquiler es gratis este año para los arrendatarios locales. Los milperos (los que siembran milpa) pueden continuar manteniendo sus comunidades, Miramar y San Marcos. A cambio de la tierra, se aplican ciertos términos. Por ejemplo, no más herbicida; las malas hierbas se deben cortar y dejar caer a mano. 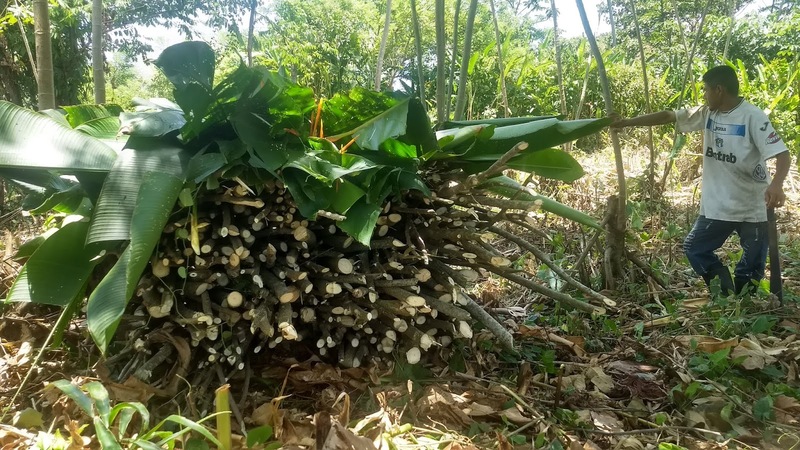 Otro ejemplo, no más monocultivos; toda la tierra sembrada con milpa también debe intercalarse con bambú, árboles frutales y otros cultivos perennes. Dichos términos ayudan a implementar un nuevo sistema agroforestal aquí en Wübu, un Modelo para el Desarrollo Rural cerca de Livingston, Guatemala. 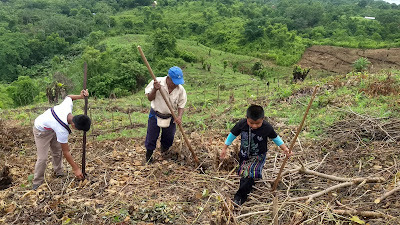 Milpero Antonio planting bamboo along a contour line. 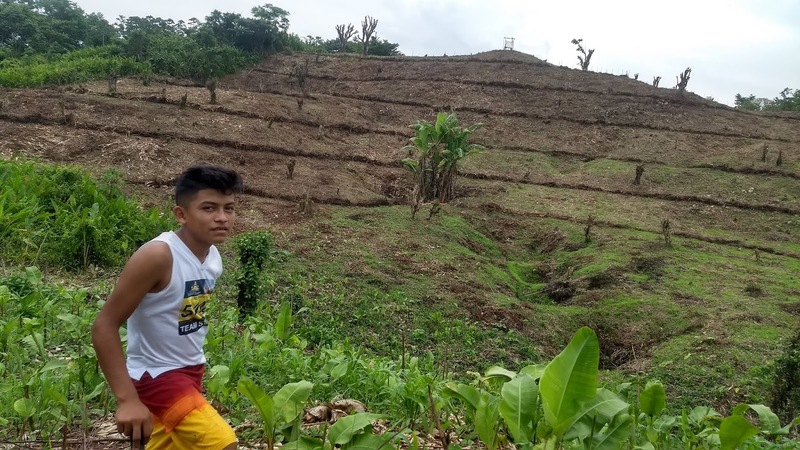 With steep slopes (up to 45°) and high rainfall (140 inches annually), these mountains of Guatemala's Caribbean coast can suffer serious erosion problems, especially when agriculture removes their protective vegetation. Chemical, mono-crop cornfields need fallow years to recover. 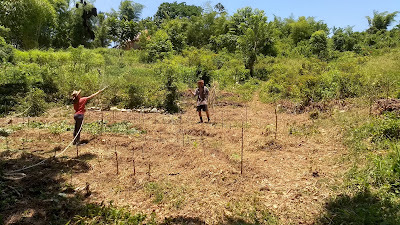 Interplanting lines of bamboo and trees, however, leaves permanent protection (and production). Furthermore, these lines are on contour, meaning perpendicular to the slope and the flow of rainwater runoff. Such lines prevent soil erosion, up to 90% according to one study. Fortified with stakes and brush piles, the lines form physical barriers that accumulate debris and eventually become terraces over time. 175 fruit trees: mango, guayaba, avocado, zapote, lime, coconut and santa maria. 175 árboles frutales: mango, guayaba, aguacate, zapote, limón, coco y santa maria. First the milperos selected their patch of jungle and cleared it. Then, before planting their corn, we moved in to build the contour lines. Mark - Using an A-level, mark the contour line across the mountainside. Clear ahead with a rake so the A-level can sit flat on the ground. Stake - Insert a stake at each point marked by the A-level, at least 1' deep, using a rock bar on rough ground. Since our A-level was over 5' wide, we inserted additional stakes in between each point. Wall - Raking brush or dragging logs, pile all organic matter against the stakes to form a wall. Plant - Plant a line of bamboo, trees or other perennial crops about 1-meter uphill of each wall. The stakes will resprout, forming one line, while the planted crops will form a second. This double line is what catches debris and forms terraces over time, as illustrated above. Primero los milperos seleccionaron su parcela de selva y la limpiaron. Luego, antes de plantar su maíz, los empleados y voluntarios de Wübu se unieron para construir las líneas de contorno. Marcar: utilizando un nivel A, marcar la línea de contorno a través de la ladera de la montaña. 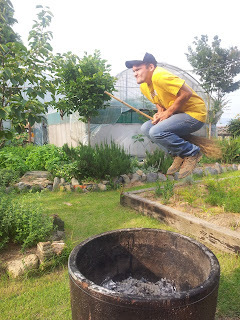 Despejar hacia adelante con un rastrillo para que el nivel A pueda quedar plano en el suelo. Estacar: insertar una estaca en cada punto marcado por el nivel A, al menos 30 cm de profundidad, utilizando una barreta en terreno accidentado. Como nuestro nivel A tenía 1.65 m de ancho, insertamos estacas adicionales entre cada punto. Hacer muro: rastrillar maleza o arrastrar troncos, apilar toda la materia orgánica contra las estacas para formar una pared. Plantar - Plantar una línea de bambú, árboles u otros cultivos perennes alrededor de 1 metro cuesta arriba de cada pared. Las estacas rebrotarán, formando una línea, mientras que las cosechas plantadas formarán un segundo. Esta doble línea es lo que atrapa escombros y formará terrazas a lo largo del tiempo, como se ilustra arriba. Jorge, Pablito and Pedro (right to left). Raking, marking and staking, respectively. with volunteers building walls in the background. 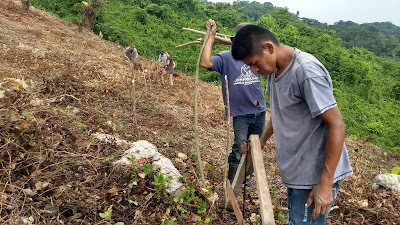 For labor, constructing and planting the 1.25 miles of contour lines required an estimated 150 man-hours, or about 4 full days for a team of five. Not bad for 6.2 acres of terraces that could last hundreds of years. Para el trabajo, la construcción y la plantación de los 2 km de líneas de contorno requirió un estimado de 150 horas / hombre, o aproximadamente 4 días completos para un equipo de cinco personas. Nada mal para 2.5ha de terrazas que podrían durar cientos de años. Of the estimated 2,447 stakes, the majority are Madre de cacao (Gliricidia sepium). Cut branches from this tree quickly resprout and grow into a new tree, making it popular throughout the tropics to form live fences. Here at Wübu mature rows of Madre de cacao are like relics of the old agriculture regime, marking the boundaries of former pastures, and now provide us with our stakes. De las 2,447 estacas estimadas, la mayoría son Madre de cacao (Gliricidia sepium). Las ramas cortadas de este árbol brotan rápidamente y se convierten en un nuevo árbol, haciéndolo popular en los trópicos para formar cercos vivos. Aquí, en Wübu, las hileras maduras de este árbol marcan los límites de los pastizales anteriores y también nos proporcionan nuestras estacas. Pablito with hundreds of Madre de cacao stakes. Others species that "stick," or resprout from cuttings, include jobo (Spondias mombin), pito (Erythrina edulis) and chino (Bursera simaruba). Aside from forming the physical barrier that catches debris and erosion — the lower wall of the future terrace — these species can be cut back and resprout, providing mulch for the crops and more debris for the walls. 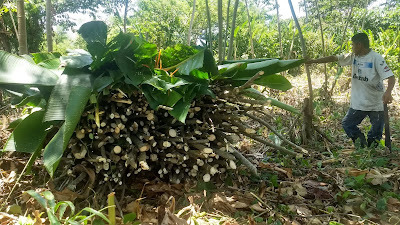 They are also legumes, which fix nitrogen and improve soil fertility for all plants throughout the agroforestry system, bamboo, trees and corn. Otras especies que se "pegan" o brotan de esquejes incluyen jobo (Spondias mombin), pito (Erythrina edulis) y chino (Bursera simaruba). Además de formar la barrera física que atrapa los desechos y la erosión, la pared inferior de la futura terraza, estas especies pueden ser cortadas y rebrotadas, proporcionando abono verde para los cultivos y más desechos para las paredes. También son legumbres, que fijan el nitrógeno y mejoran la fertilidad del suelo para todas las plantas en todo el sistema agroforestal, el bambú, los árboles y el maíz. Marlo, hired by milperos to scare away birds. Encouraging a shift from corn monoculture to this agroforestry system has two main objectives. One, develop local economies; crops will be more diversified and profitable; labor will be more permanent and skilled (e.g. 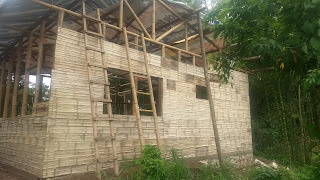 bamboo construction, fruit preservation). Two, regenerate ecosystem health like soil fertility, erosion control, wildlife habitat... all crucial for sustaining objective one. Both objectives, economic and ecological, stem from "eco," from the Greek word oikos, meaning "home." We believe these jungle mountains at Wübu can be home to both healthy ecosystems and wealthy communities. Both nature and humanity can live together in harmony, as long as we follow sustainable farming practices informed by both modern science and traditional knowledge. Learn more about Wübu on facebook or our official website. 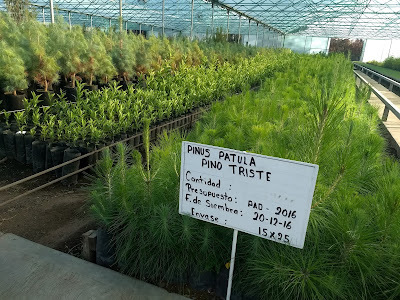 Alentar un cambio del monocultivo del maíz a este sistema agroforestal tiene dos objetivos principales. Uno, desarrollar la economía local; los cultivos serán más diversificados y rentables; el trabajo será más permanente y calificada (por ejemplo, construcción de bambú, consevación de fruta). Dos, regenerar la salud de los ecosistemas, como la fertilidad del suelo, el control de la erosión, el hábitat de la vida silvestre ... todo es crucial para mantener el objetivo. Ambos objetivos, económicos y ecológicos, se derivan de "eco", de la palabra griega oikos, que significa "hogar". 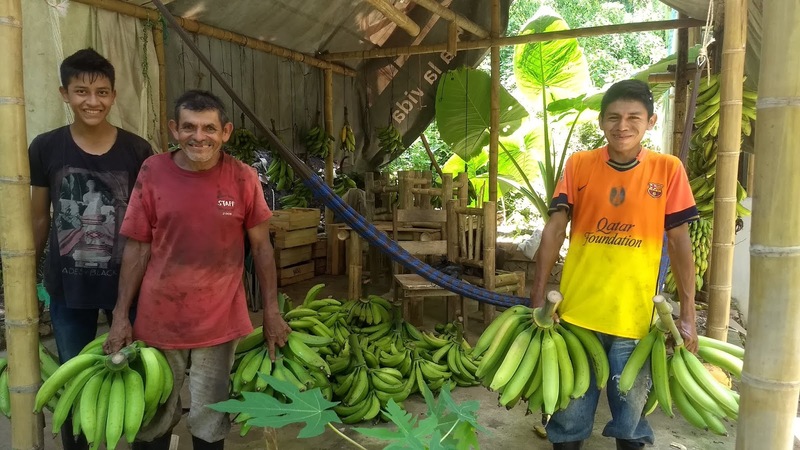 Creemos que estas montañas de la jungla en Wübu pueden albergar ecosistemas saludables y comunidades ricas. Ambos la naturaleza y la humanidad pueden vivir juntas en armonía, siempre que sigamos prácticas agrícolas sostenibles informadas por la ciencia moderna y el conocimiento tradicional. Obtenga más información sobre Wübu en Facebook o en nuestro sitio web oficial. P.B. Dharmasena, Use of Gliricidia Sepium for Erosion Control in Rainfed Uplands of the Dry Zone, 1992. On past projects I've worked mostly in the fields--building soil, planting trees, designing gardens. 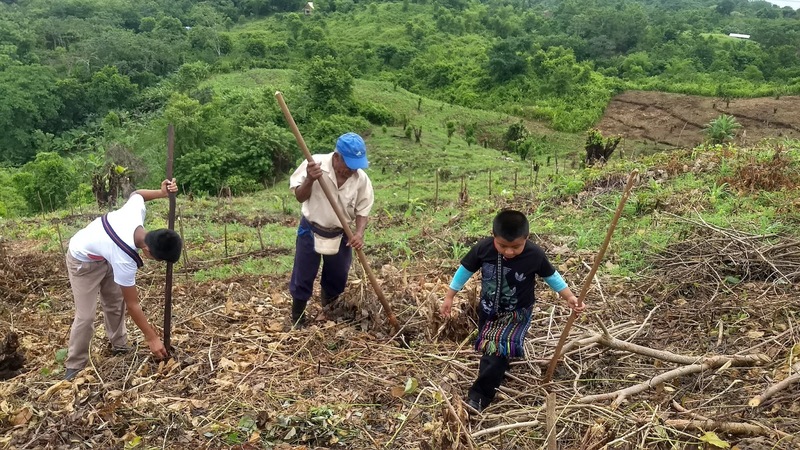 However, there isn't a very high demand for such work here in Chiapas, where the majority already practice their own subsistence agriculture, and physical laborers can be hired for 80 pesos a day ($4.5 USD). Instead, Omero Guillen Villatoro, agricultural engineer and renowned leader of community development projects, has recruited me to make videos. Promoting tourism and raising awareness has been my focus, the most productive use of my time here, according to Omero's vision and the circumstances of rural Chiapas.